Truth is timeless, which is why I am sharing this blog. It was written several years ago while in the midst of international ministry, fulfilling my passion to bring the fullness of the Kingdom of God to our children. 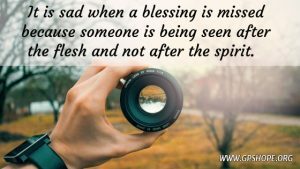 Sadly, I have been in too many situations where a blessing was missed because someone was being seen after the flesh and not after the spirit. This goes from receiving prayer for a healing, to being given an encouraging prophetic word, to even failing to mentor and disciple the younger generations for leadership. I have seen a church community struggling to have a vibrant outreach to families, where the entire leadership was in their 50’s and 60’s when they finally started to mentor the generation in its 40’s. God is a generational God. He does not want just one generation to flow in anointing and leadership. This is all through scripture. One obvious example is in 1 Samuel 3, with Samuel himself. As a young child, he ran to Eli three times one night, hearing his name being called. 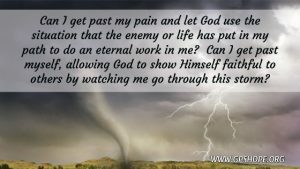 Once Eli realized what was happening, he took the time to instruct Samuel, telling him that it was God calling his name, and for Samuel to ask God what He wanted. Samuel followed the instructions of Eli, and God downloaded a very heavy prophetic word to this young boy! All Samuel needed was some training and instruction. With the release of the Holy Spirit (after Jesus died and went up to heaven) our children have a much greater ability to have God speak to them and work through them than Samuel did. 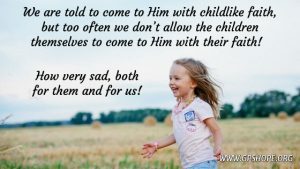 We are told to come to Him with childlike faith, but too often we don’t allow the children themselves to come to Him with their faith! How very sad, both for them and for us. Going back to the young worship leader mentioned at the beginning, I was so blessed by what she shared with me when I brought up this subject to her. I can’t think of a way to ease into this, so I am going to just dig right in. Having someone close to us die, causes us to think and live differently. We realize how fragile life is, and we want to make the most of it. At least for a while. When we are fully aware that we will all die and are not afraid to read about it, talk about it, even meditate on it, it awakens us to live a fuller life, which brings more peace, more contentment and more joy. I believe that is because it is allowing the Holy Spirit to shed His light into a dark closet of our hearts that we didn’t want opened. And now the light is flooding in and it becomes a blessing in our lives because of the tormenting fear that has been removed and the freedom it brings. Death can either be something we try to avoid that the enemy can use in our lives, or it can be what God says it is, a transfer to a different home, and be a tool the Holy Spirit can use to learn how to live in His presence now, instead of waiting for that transfer. I am not going for a tattoo as a reminder, but I have written myself a note and placed it where I will see it every night before heading to bed that says, “Did I live today fully alive and to its fullest potential?” This is in hopes that during the day as I make choices for my time, and even sitting alone with my thoughts, that I will do so, knowing I want to be able to answer this question with a resounding “Yes, I did!” at the end of every day. I know that will look differently for each of us, and even change for each of us in the different seasons of life. But whatever season you and I are in, even if it is a season of deep grief, I pray we will be able to do so in a way that gives life. How about you? 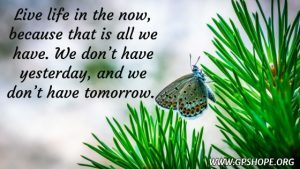 What are you doing to remind yourself that we all will die, and therefore each day, each moment, to LIVE? I would love to hear from you in the comments below. Are You Running the Wrong Race? When we see a race, whether it be runners, cars or horses, everyone at least starts in their own lane. In a few races the competitors stay in their own lane, but on many race tracks they converge into one bundle of racers. Either way, they are all on the same track and are competing against each other to see who comes in first place. Even though some of us might not like to admit it, we tend to see our spiritual lives the same way. 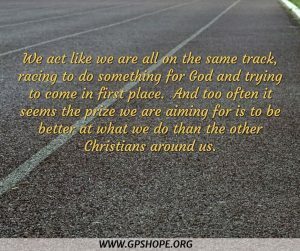 We act like we are all on the same track, racing to do something for God and trying to come in first place. And too often it seems the prize we are aiming for is to be better at what we do than the other Christians around us. We sometimes need to remind ourselves that is not how God set it up. Yes, we are all in a race, but we all have our own separate track to run on. We are not competing against anyone else. In Hebrews 12:1 Paul tells us, “Since we have such a huge crowd of men of faith watching us from the grandstands, let us strip off anything that slows us down or holds us back, and especially those sins that wrap themselves so tightly around our feet and trip us up; and let us run with patience the particular race that God has set before us.” (TLB) The NIV Bible says to “…run with perseverance the race marked out for us”. 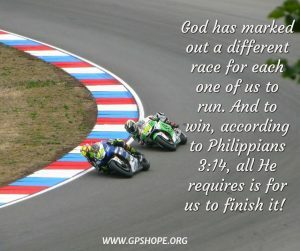 God has marked out a different race for each one of us to run, and to win, all He requires is for us to finish it! “I press on to reach the end of the race and receive the heavenly prize for which God, through Christ Jesus, is calling us.” Philippians 3:14 (NLT) “I have fought the good fight, I have finished the race, and I have remained faithful.” 2 Timothy 4:7 (NLT) “…We run for the crown that we will wear for eternity.” 1 Corinthians 9:25 (VOICE) If we are faithful to finish, we each win the first place eternal prize for our race! We shouldn’t be trying to run someone else’s race. Let’s think about this. Why doesn’t a long-distance runner compete as a sprinter? Because he has the tools for endurance, not speed. Why doesn’t a shot-put thrower enter the hurdles race or the pole vault? Because he has the arm muscles to throw, not the legs to jump. 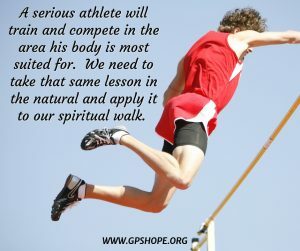 A serious athlete will train and compete in the area his body is most suited for. We need to take that same lesson in the natural and apply it to our spiritual walk. What has God put in you and created you to do while on this earth? Allow yourself to be trained and equipped in that area. Let’s stop trying to be someone we were not created to be, which causes competition in the Body of Christ. Instead, let’s be a united team, supporting each other’s unique God-given talents, abilities and anointings. Is there something you do that helps keep your eyes focused on the true race? 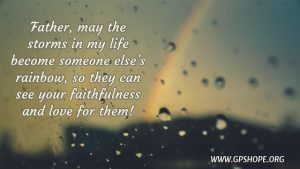 I would love to have you share it below. The new year is now upon us. For most people, anything that is new evokes a measure of excitement with possibilities, especially a new year. But for those who have had to face the darkness of the death of their child, new can bring almost a panicked feeling, as if we are leaving our child behind. 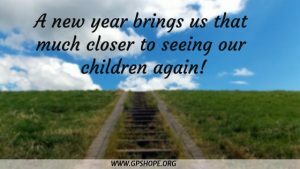 This especially applies to the new year for those who lost their child within the past year. My daughter, Becca, died on October 12, 2011. I remember feeling almost terrified that I couldn’t stop 2012 from coming, which meant I would no longer be in the same year I last shared with my daughter. It felt like another level of shutting the door on her life that I just wasn’t going to let happen. I know I don’t have to explain it to those who have lost a child, and it really can’t be explained to those who have not. Since that time, I have come to learn that the word new doesn’t have to fill our hearts with dread and sadness. But that doesn’t mean we don’t struggle going into a new year. And as we go along, some years can be harder than others, for no apparent reason. 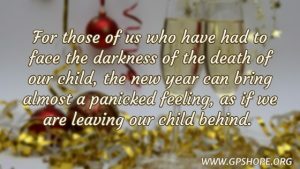 I wanted to share some things that a new year brings to bereaved parents, so that we can know that it isn’t just us, but that the same things affect many of us who have had a child die. 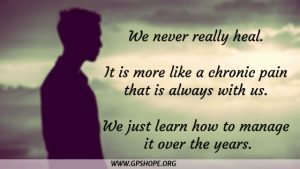 It also gives an opportunity for those around us to have a better understanding of what it means for a bereaved parent to go into a new year without our child. Many people around us seem to think if they bring up our deceased child that it will remind us of our loss, resulting in pain and maybe even tears. News flash: We are already thinking of our child, and we are still hurting deeply! So, if someone mentions our child, it does just the opposite; it is a gift we are being given that our child has not been forgotten. The other side of that is not understanding why people get freaked out when we talk about our child. As a parent, just because our child isn’t around us, doesn’t mean we don’t talk about them. It is the same for those of us whose child has died. 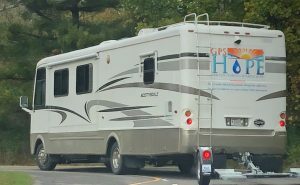 Our children have just traveled to a place further away than most children who might take a trip. And they won’t be returning to us here; we will be going to meet them some day. But they still exist, they are still deeply loved, and they will remain in our hearts and minds until we are with them again. When our child dies, for the first couple of years at least, our hearts are fighting to accept what our minds know. That causes us to be almost fixated on their death, which people around us usually think is wrong and unhealthy. Here is where we must be honest with ourselves in whether we want to get past this part of our grief. As we know, there are so many reasons (that won’t make sense to those who have not lost a child) that deep down, cause us to be afraid to take steps toward hope, light, and living a life of purpose and fulfillment. The two most common reasons are that we feel guilty for even wanting to enjoy life again, and we are afraid that we are leaving our child behind by moving forward. And to help you with that, I would like to give some suggestions to move you in the direction of seeing things with a slightly different view. 1. We aren’t just facing a new year, but it is a new month. And a new month often brings new weather. And because it is January, it means we are moving toward spring! Those of us who are in the cold northern states truly appreciate this. Yes, I understand that winter has just begun, and I know how winter makes everything look so dead (depending on where we live), and it can really affect our mood. However, it is just a season, and new life always returns, no matter how harsh or how long the winter has been. 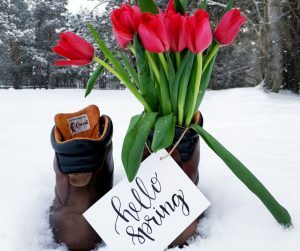 So, it is a wonderful reminder that no matter how long or how deep into darkness our grief has taken us, spring IS coming at some point, with new life and new hope. 2. A new year brings new opportunities. Some of you may not see that as a good thing, but it does bring new opportunities to do something different that will possibly take some of the sting away. If you know it is going to be difficult, ask yourself what you can do differently that will help. Maybe you can change the focus from dwelling on your painful loss to thinking about your child’s gain and do what you can to picture them in heaven and what it is like for them. 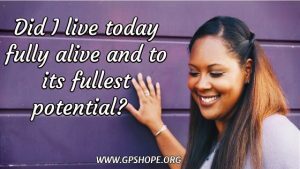 So, it does bring new opportunities to move toward a healing that allows you to learn how to live in hope, light, and even move toward having meaning and purpose again. You may think that is impossible, but those of us who thought it was impossible for us as well are here to encourage you. 3. Sometimes we dread going forward, because we feel like it is taking us further away from our child who has left this earth. I have shared this before, but it is worth repeating. God graciously pointed out to me once (when I was feeling that way) that I am not getting further away from Becca, but I am getting closer to her. Each day I am here brings me one day closer to being reunited with her again! So, a new year brings us that much closer to seeing our children again. Hoorah!!!! New is a word that can mean hope. A new year can bring new hope, new light, new life and new possibilities. How about you? Do you want to make 2019 a year where you move away from fear and move into peace and a greater measure of healing for your shattered heart? If so, then let’s do this together! If you would like a list of ideas on how to honor the life of your child, just let us know and we will be happy to send it your way.